Care Supervisor, Daniela Christea tells us about a program of shows and concerts arranged by the Care and Drama volunteers in Romania. 'Last year the volunteers from the foster homes in Tarlungeni started a new type of program to help the children socialize: they organized shows, carnivals and puppet shows with the help of a newly formed group of amateur artists composed of the educators from the foster homes, Laura the psychologist from Child Protection and myself. It all started in the summer of 2007, with the French volunteer, Mathias Pichot and his guitar. 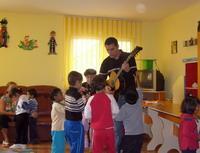 He came to Romania for the Care Project and managed to communicate with children with psychical disabilities through music, winning their hearts. That's how we got the idea of organizing a concert with Mathias playing the guitar, Laura on the organ and me singing. Another Care volunteer, Carol Hudson, offered great help with the scenery. The concert was a real success and we decided to carry on creating occasions for the children to interact with other people. Since then, more volunteers from both the Drama and Care Projects have showed their interest in creating and being part of the shows and carnivals. The group is in continuous change. Even if the Romanian part of it is about the same, the Projects-Abroad volunteers are changing every few months and so we always have fresh ideas and enthusiastic people that keep it interesting. The satisfaction comes from the children's laughter and their involvement and appreciation of the shows, but the fun part starts way back at the rehearsals, when we choose the plays for the puppet shows, the songs to sing, the poems to recite and brainstorm all the ideas for the show.